Carol Mattusch was elected president of the American Friends of Herculaneum at last week's annual board meeting. She replaces founding president Ann Kuttner who will continue to serve the organization as a member of the governing board. Prof. Mattusch is Mathy Professor of Art History at George Mason University. 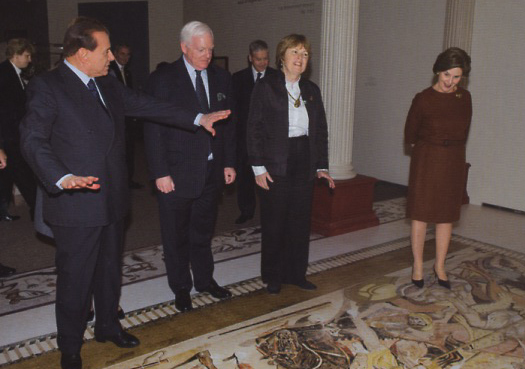 She has curated recent, important exhibits on Herculaneum and Vesuvian culture at the National Gallery of Art and (with board member Ken Lapatin) at the Getty and the LA County Museum of Art. She has served in numerous positions in the American School of Classical Studies at Athens and in the Archaeological Institute of America. Her publications on Greek bronzes and Vesuvian art history have won significant book awards. The Last Days of Pompeii: decadence, apocalypse, resurrection (Malibu, 2012). mann: Letter and Report: Antiquities, Archaeology, and Politics in 18th-Century Naples (Malibu, 2011. Of her several other books especially the two on Vesuvian studies, Pompeii and the Roman Villa: Art and Culture around the Bay of Naples (Washington DC, 2008) and The Villa dei Papiri at Herculaneum: Life and Afterlife of a Sculpture Collection (Malibu, 2005), are already in the hands of all serious students of Herculaneum. Prof. Mattusch has a long-standing involvement with the Friends of Herculaneum. Before her election, she was a founding member of the Board. She was a headliner speaker on "How the Villa dei Papiri wrote the History of Ancient Art" at the 2006 UK Friends of Herculaneum colloquium held at the British Academy for the Humanities and Social Sciences in London. And her report on the National Gallery exhibit she curated appeared in issue 12 of Herculaneum Archaeology: the Friends' newsletter. Friends of Herculaneum will look for exciting advances in AFoH under Prof. Mattusch's leadership.